Interestingly, Swan Neck deformity has nothing to do with swans or necks. It is a malformation of the finger where the DIP (or Distal Interphalangeal) joint is bent towards the palm (hyperflexed), and the PIP (or Proximal Interphalangeal) joint is bent away from the palm (hyperextended). 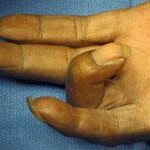 The result is a bent finger that resembles a swan’s neck, hence the name swan neck deformity. Reflex Sympathetic Dystrophy, or RSD, is a condition that produces burning pain, discoloration of the affected area, stiffness, sweating and swelling. If not treated, it can result in chronic stiffness or loss of use of the affected area. When you were growing up, did you hear things like, “Don’t crack your knuckles, you’ll get arthritis.” Or “I swear the weather’s changing. I can feel it in my bones because of my arthritis.” There is some truth to the latter sentence, but the first one is simply a wives tale. Arthritis is not caused by cracking your knuckles, but some people with the diagnosis can feel when the weather changes, because of the effects it has on the joints, like swelling or stiffness. Do you suffer from Cubital Tunnel? Today’s article is to give you hope, that there is a light at the end of all this suffering! First of all…what in the world is Trigger Finger? It isn’t just for the gun enthusiast! Trigger finger is when one of your fingers becomes stuck in a bent position. It isn’t something that just happens overnight. I’m sure you have never thought about this before but wrist pain really can predict your future! In fact, without even knowing you, I can predict your future if you have wrist pain. Don’t believe me? Check this out! Sounds complex! It’s pretty easy to understand, especially if you have it because who doesn’t understand pain? Complex Regional Pain Syndrome is a chronic condition that affects your limbs; arms, legs, hands and feet. It’s a condition that is more common in women and people over the age of 40, however, it can also strike your teenager! So, the other day, I was in a hospital cafeteria filling up my daily allotment of carbonated, caffeinated, get me through the morning, mug of soda. An old friend saw me and came by to say hi. We stood around chit chatting for a few minutes and the conversation became more involved. And by more involved, I mean, I had to find a counter to put my soda down so I could actually talk to her…with my hands! I didn’t realize how much I speak with my hands to get thoughts from my crowded head…into theirs! It’s a word that one can scarcely pronounce let alone wonder if they have the condition. De Quervain, pronounced dih-kwer-VAINS, is a painful condition in the tendons at the base of the thumb and side of the wrist. It is also known as De Quervain’s Tenosynovitis. It is unusual to wonder if you have this condition, the pain will be clear and will get you into the doctor sooner than later. If you have De Quervain’s, you will notice discomfort in turning your wrist, grasping anything, or making a fist. Earlier in the week, we had the depressing chat about all the ways Osteoarthritis can change our life, and we’re not talking for the better! Any arthritis is a tough challenge to live through because of the ever present pain. Just because you live with Osteoarthritis, doesn’t mean it has to get the best of you. Here are 10 things you can start doing (after you check with your doctor) to kick Osteoarthritis to the curb or at least calm down the symptoms and pain. Arthritis is a hot topic these days and the World Wide Web is not short on information regarding all types of arthritis and the many things that can go wrong. It’s hard to weed out what is accurate and what is just plain crazy talk! Bone density seems to be that thing we only think about when we hit 50 and menopause and usually, it’s the doctor that has to breach the subject. As women, we love to live in denial! Did you know that not all pain was created equal? There are all kinds of pain but one thing we don’t need to tell you is how much pain is…well…such a pain! It can change the quality of our life faster than anything. Anymore, stress is just part of daily life. We come to expect it, count on it and even plan for it. Stress can happen just because it’s a Monday! Ganglion Cysts. You may have heard of them before and along with it, probably came some folklore about the somewhat primitive, even brutal rumors that doctors would hold your hand down and smash the cyst with a large, heavy book! It’s likely, that if you hear someone mention the word Arthritis, you immediately think of Rheumatoid or possibly Osteoarthritis, two of the most common arthralgia. Carpal tunnel can strike if you are one to do repetitive motions with your hands and wrists. It starts as a numbness and tingling in your thumb and index finger but from there can escalate to loss of grip and other complications. Come in and see us for some help with early intervention. 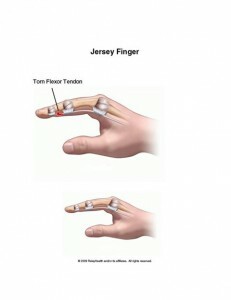 Jersey finger: An injury to the tendons that prevents one from making a fist. 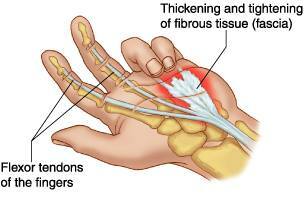 The second mishap of the fingers is Mallet finger: An injury that prevents the finger from straightening. Let's get back to keeping our fingers happy...Trigger finger: When inflammation and swelling occurs in the tendons of the fingers from overuse and sometimes arthritis. 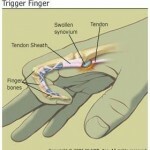 If you think you have trigger finger, come in and let us take a look.